Packaging, especially flexible packaging, is one of the most dynamic industries today owing to its extensive application in the food and beverages, personal care, and pharmaceutical sectors. The rising demand for bi-axially oriented polypropylene (BOPP) in packaging, labeling, printing, and lamination can be primarily attributed to the booming growth in the aforementioned industries. Transparency Market Research predicts that the demand for BOPP will be in line with that of flexible packaging in the near future. It is also likely to be consistent with the growth of the food and beverages industry. By revenue, the BOPP market is poised to expand at a 5.8% CAGR from 2016 to 2024, with the value rising from US$12.7 bn in 2015 to US$20.9 bn by the end of the forecast period. The market is projected to register a 6.3% CAGR in terms of volume between 2016 and 2024. BOPP finds application mainly in the food industry and this segment is the leading contributor to the growth of the BOPP market in terms of volume. BOPP is used for packaging and labeling in the food industry and the growing demand for snacks, cakes, breads, ready-to-eat packaged foods, frozen foods, and confectioneries has impacted the demand for BOPP in this sector. The food sector is also anticipated to be the fastest growing application segment by the end of the forecast period. Considering the growing demand for tapes in industrial packaging, the tapes segment also holds lucrative opportunities for players in the BOPP market. The global BOPP market is geographically segmented into North America, Central America, Latin America, Europe, Asia Pacific, and the Middle East and Africa. In terms of volume, Asia Pacific leads the global BOPP and the region accounted for a share of more than 55% in 2015. Poised for considerable growth over the course of the forecast period, the APAC BOPP market is likely to be driven by the high demand for BOPP for the production of packages and labels in the food industry and tapes for industrial packaging purposes. China is one of the leading consumers of BOPP in the region. The Middle East and Africa and Latin America BOPP markets are projected to witness moderate to high growth by 2024, owing to the expansion of the food industry and the rising demand for packaged products. 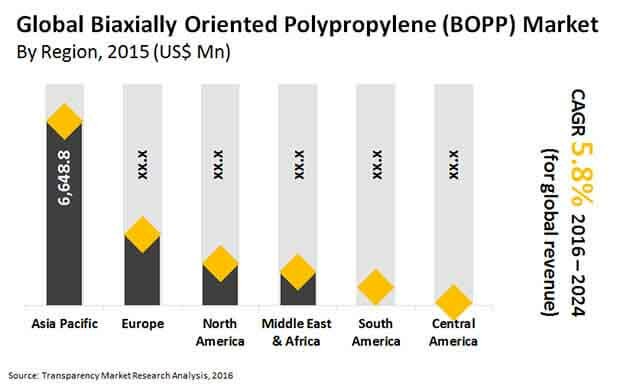 Countries within the GCC are expected to be key markets for BOPP in the Middle East; South Africa and Nigeria are likely to play a leading role in the BOPP market in Africa; Brazil, Argentina, Colombia, and Chile hold promising prospects for the BOPP market in Latin America. The BOPP market is highly fragmented, marked by the presence of several major players. Some of the prominent companies in the global BOPP market include Kopafilm Elektrofolien GmbH, SRF Limited, Chemosvit A.S., Tempo Group, Taghleef Industries, Vibac Group S.p.A., Treofan Group, Rowad Global Packaging Co. Ltd., Zubairi Plastic Bags Industry LLC, Poligal S.A., Futamura Chemical Co., Ltd., Manucor S.p.A., Oben Holding Group, Innovia Films, Xpro India Limited, Uflex Ltd., Jindal Poly Films Ltd., Biaxplen Ltd., BIOFILM, Cosmos Films Ltd., Dunmore Corporation, Polyplex Corporation Limited, and Vitopel S.A.
Bi-axially oriented polypropylene (BOPP) is polypropylene based film or sheet stretched across two axes in a sequential manner. BOPP films are manufactured using tubular film and stenter processes. Commercially, stenter process is preferred to the tubular process considering the inherent advantages such as mass production and extensive thin films. Presently, BOPP films are available in various product forms, such as plain BOPP films, matte BOPP films, heat sealable BOPP films, and anti-fog BOPP films, wherein each of these films offers varied properties that makes it suitable for usage in wide range of applications. BOPP films are primarily employed in the food industry for packaging of frozen food, meat & cheese, pet food, bakery products and confectionaries, and fresh produce. Rising demand for these applications in various regions is likely to propel demand for BOPP films in the near future. BOPP is also used in tapes, tobacco packaging, gift packaging, cosmetics packaging, pharmaceutical packaging, lamination, and other applications. Flexible packaging is used in majority of these applications. Considering the extensive growth of the global flexible packaging market, demand for BOPP is projected to increase significantly in the next few years. Asia Pacific dominates the BOPP market in terms of production and demand. Countries such as China, India, Thailand, and South Korea are expected to be the key producers and consumers of BOPP. Growth of the market is likely to be restrained due to fluctuation in raw material prices, as these are dependent on crude oil prices and supply of BOPP in the market. These factors are projected to hamper market growth during the forecast period. Rising demand for specialty films in the packaging industry is expected to act as a major opportunity in the BOPP market in the next few years. This report analyzes and forecasts the market for BOPP at the global and regional level. The market has been forecast based on volume (kilo tons) and revenue (US$ Mn) from 2016 to 2024, considering 2015 as the base year and historic trend from 2013 to 2015. The study includes drivers and restraints of the global BOPP market. It also covers impact of these drivers and restraints on demand for BOPP during the forecast period. The report also highlights opportunities in the BOPP market at the global and regional level. The report includes detailed value chain analysis, which provides a comprehensive view of the global BOPP market. Porter’s Five Forces model for the BOPP market has also been included to help understand the competitive landscape in the market. The study encompasses market attractiveness analysis, wherein applications are benchmarked based on their market size, growth rate, and general attractiveness. The study provides a decisive view of the global BOPP market by segmenting it in terms of applications such as food, tapes, tobacco, and others including consumer goods, labels, and other packaging. These segments have been analyzed based on present and future trends. Regional segmentation includes current and forecast demand in North America, Central America Europe, Asia Pacific, South America, and Middle East & Africa. The report provides the actual market size of BOPP from 2013 and estimated market size for 2016 with forecast for the next eight years. The global market size of BOPP is provided in terms of volume and revenue. Market volume has been defined in kilo tons, while market revenue is in US$ Mn. Market numbers are estimated based on key applications of BOPP. Market size and forecast for numerous applications have been provided in terms of global, regional, and country level markets. In order to compile the research report, we conducted in-depth interviews and discussions with a number of key industry participants and opinion leaders. Primary research represented the bulk of research efforts, supplemented by extensive secondary research. We reviewed the key players’ product literature, annual reports, press releases, and relevant documents for competitive analysis and market understanding. Secondary research includes a search of recent trade, technical writing, Internet sources, and statistical data from government websites, trade associations, and agencies. This has proven to be the most reliable, effective, and successful approach for obtaining precise market data, capturing industry participants’ insights, and recognizing business opportunities. The report comprises profiles of major companies operating in the global BOPP market. Key players in the BOPP market are Jindal Poly Films Ltd., Dunmore Corporation, Innovia Films, BIOFILM, Taghleef Industries, Treofan Group, Vibac Group S.p.A., Futamura Chemical Co., Ltd., Poligal S.A., Manucor S.p.A., Uflex Ltd., Cosmos Films Ltd., Tempo Group, Polyplex Corporation Limited, Kopafilm Elektrofolien GmbH, Rowad Global Packaging Co. Ltd., Zubairi Plastic Bags Industry LLC, Chemosvit A.S., Xpro India Limited, SRF Limited, Oben Holding Group, Biaxplen Ltd. and Vitopel S.A. Market players have been profiled in terms of attributes such as company overview, financial overview, business strategies, and recent developments.